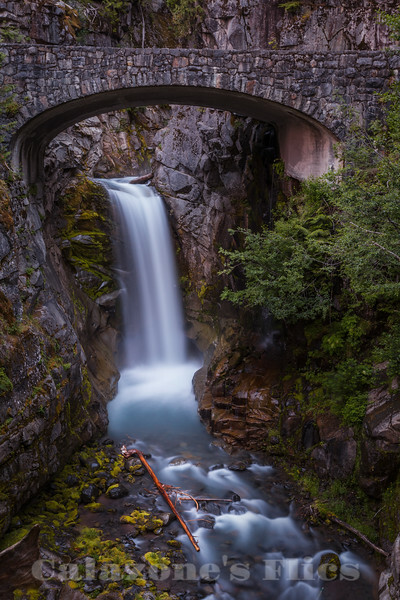 Christine Falls is a waterfall on Van Trump Creek in Pierce County, Washington. The falls are 69 feet (21 m) feet high and are best known for having a bridge spanning the lower drop. The upper drop is 32 feet (9.8 m) high and is almost impossible to film in tandem with the oft-photographed 37-foot (11 m) lower tier. The lower tier is probably one of the most commonly photographed locations in the Mount Rainier area. The falls were named in honor of Christine Van Trump, the daughter of P. B. Van Trump. In 1889 Christine, then nine years old, accompanied her father on an ascent of Mount Rainier, as far as her strength would allow. She made it to the 10,000-foot (3,000 m) level, even though she had a crippling nervous disorder. Well done with the exposure time. Love the blue water in this waterfall.